Becoming a parent is the most rewarding, difficult thing a person can do. You are suddenly in charge of a tiny, helpless human being who can’t even hold their own head up, let alone feed themselves a nutritional, well-balanced diet. Children are always growing. They do most of it in their first year, with babies averaging 10 inches of growth in length and tripling in weight. By age two, the growing has slowed down a bit, but still increases at a steady pace. Children grow roughly 2 and a half inches each year until they reach adolescence, where they undergo a huge growth spurt as they reach puberty. To encourage the best growth possible for your children, here are 10 superfoods that can help. Milk is one of the most popular beverages consumed all around the world, and has been for centuries. Milk was considered a status symbol in ancient Egypt, as only royalty and the very wealthy drank it. In 1862, a French microbiologist named Louis Pasteur developed a safer way of producing, storing and distributing milk, with the first commercial pasteurization machines introduced shortly afterwards. Aside from water, milk is probably the healthiest beverage to give your children. It’s one of the best liquid sources of calcium, which is a building block for growing strong, healthy bones and teeth. Because children experience such a rapid amount of growth in their early years, they need as much calcium as possible in order to grow their bones to the fullest potential. Lack of calcium can leave them at risk of developing osteoporosis in later years, which is a disease that causes the bones to become thinner and less dense, increasing the chance of fractures. Calcium not only supports the growth of strong bones, it also plays a vital part in releasing hormones and enzymes, and ensuring muscles and nerves work properly. 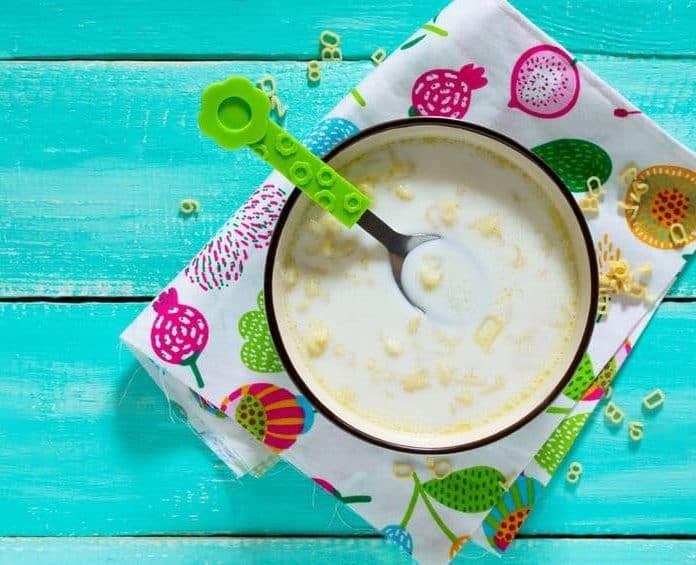 In order to help your child achieve optimum bone health, recent guidelines suggest children from age two to eight should have at least 2 and a half cups of milk per day, with that number rising to three cups once they reach nine years of age. Avoid giving cow’s milk to babies under 12 months, as they can’t digest it well. Introduce whole milk at around one year of age, and aim for milk that has been fortified with vitamin D as this is also necessary for strong bones. If you haven’t given your child milk before, it’s good to be aware of the symptoms of lactose intolerance and milk allergies. Symptoms can occur within minutes or hours of drinking milk and dairy products, and include nausea, abdominal pain, cramping, bloating, diarrhea, and gas. If you notice any symptoms, be sure to talk to your paediatrician for more information.